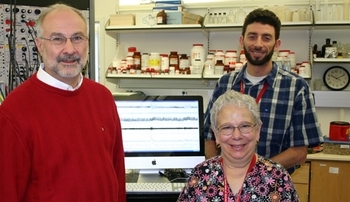 From left, Harold Schultz, Ph.D., Mary Ann Zink and Noah Marcus, Ph.D., of the UNMC Department of Cellular and Integrative Physiology. The work by UNMC’s Harold D. Schultz, Ph.D., Noah Marcus, Ph.D., and Rodrigo Del Rio, Ph.D., shows for the first time that abnormalities in autonomic control of breathing and its interaction with the sympathetic nervous system have a major negative impact on cardiac function and survival in heart failure. The article, entitled “Carotid chemoreceptor ablation improves survival in heart failure: Rescuing autonomic control of cardiorespiratory function,” demonstrates that surgical removal of chemoreceptors located in the carotid bodies markedly reduces cardiac arrhythmias and cardiac fibrosis, and improves survival in rats with heart failure. “These chemoreceptors play an important role in the control of breathing in normal conditions, but become abnormally activated in heart failure,” said Dr. Schultz. This causes disruption of breathing control, which stresses the heart by activation of the sympathetic nervous system. “The tonically activated carotid body chemoreceptors destabilize control of breathing, which stresses the heart by ventilatory-related activation of the sympathetic nervous system,” he said. Xiaohong Xia, Ph.D., of Hebei Academy of Medical Science in Hebei, China, Evan Schultz, an engineering student at UNL, and Mary Ann Zink, a research technologist in the lab, also participated in the study. Dr. Del Rio recently returned to Santiago Chile to begin a faculty position at the Universidad del Desarrollo. 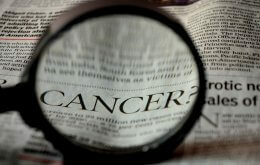 The study is also a part of a larger study that was also just published in the Journal of Physiology, a leading international journal of experimental physiology. This research is part of a NIH-funded program project grant in the UNMC Department of Cellular and Integrative Physiology.